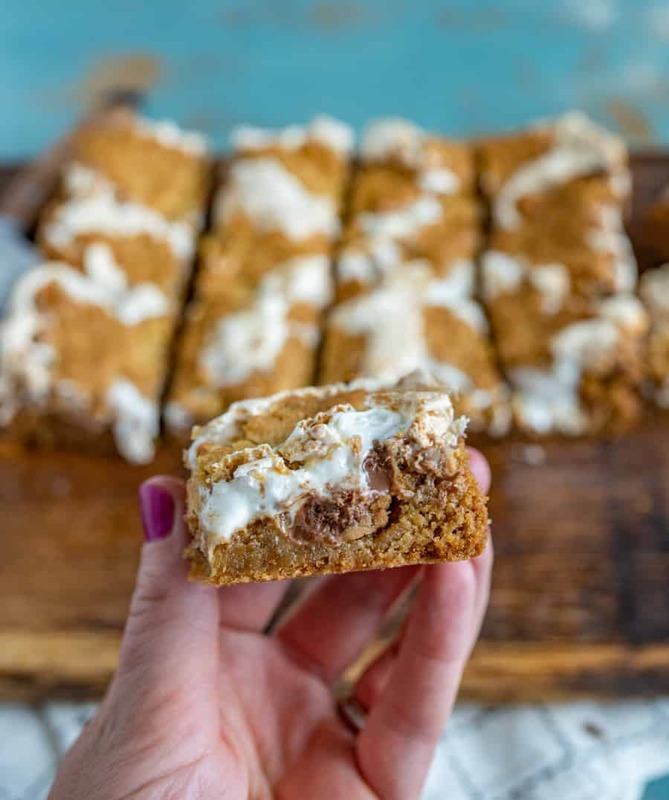 Rich and decadent Peanut Butter S’mores Bars made with a simple cookie-dough-graham-cracker crust, peanut butter, chocolate, and marshmallow creme. There are some desserts that will change your life forevermore. They have the perfect ratio of crunch to gooeyness, sweet to savory, and crust to crumble. To me, any dessert with peanut butter and chocolate could end up on that list of perfection. That flavor combo will always have a home in my heart. But the thing that really makes these bars stand out is the deliciously fun spin on regular s’mores. I don’t know about you, but s’mores always bring me back to childhood memories of camping out with family, spending time telling stories and jokes around a campfire, and capping off an outdoorsy evening with a sticky and sweet bite of graham cracker, chocolate, and toasted marshmallow. 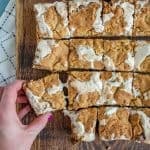 For nights when I want to recreate that nostalgic feeling in the comfort of my home, these Peanut Butter S’mores Bars do a fabulous job of taking me back in time. 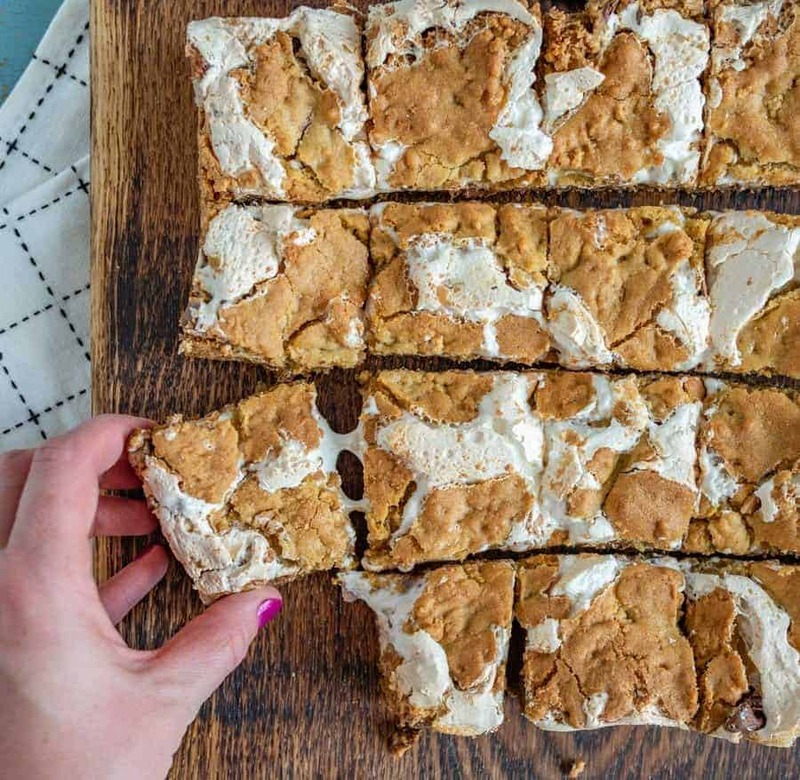 Are Peanut Butter S’mores Bars a no-bake recipe? No, you do need to bake these because the cookie dough crust and topping has egg in it. 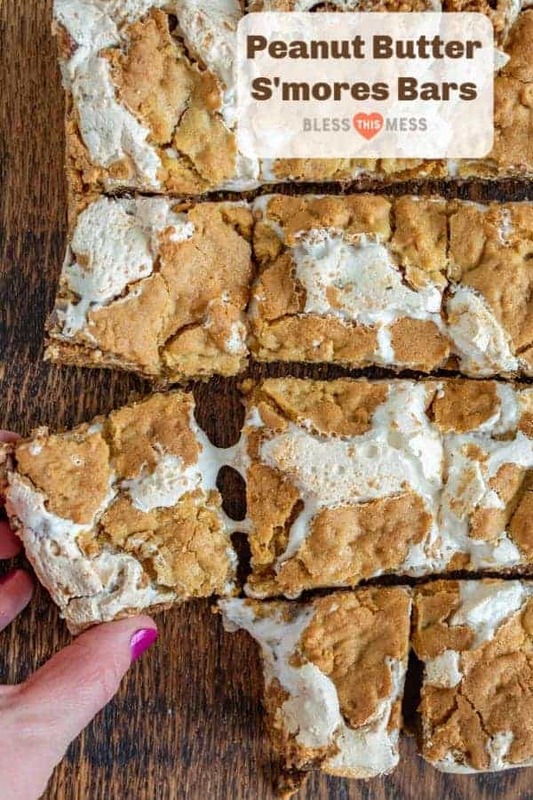 If you wanted to do a no-bake version, you may be able to get away with using a store-bought graham cracker pie crust, and then use crumbled graham cracker as the topping, instead of the cookie dough. 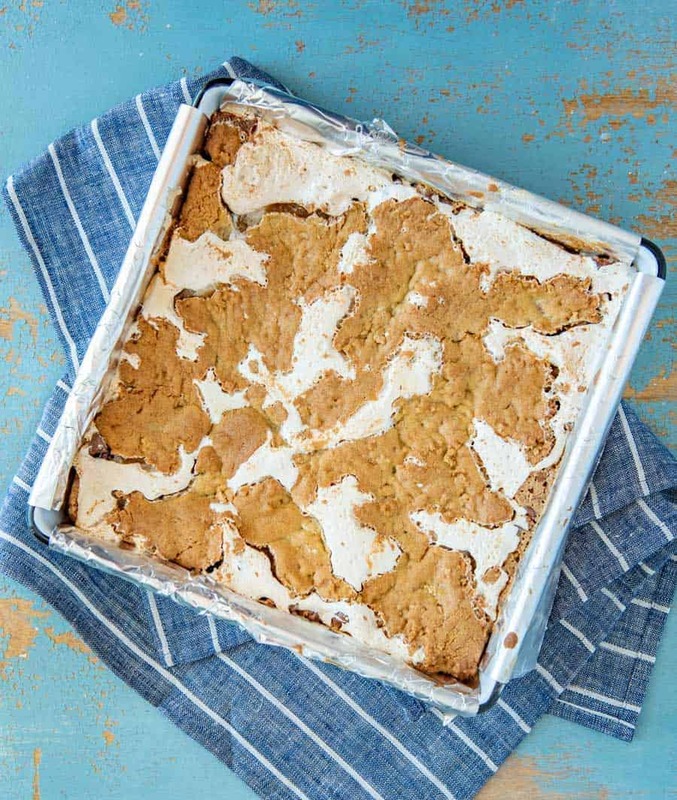 But in my personal opinion, the cookie dough crust is one of the best parts of this recipe! Plus, baking it melds together the chocolate, peanut butter, and marshmallow fluff components into a heavenly melt. If you have the time, it’s worth the bake. Can you replace the peanut butter with another type of nut butter? Definitely. This is a really great idea for those with peanut allergies, especially. 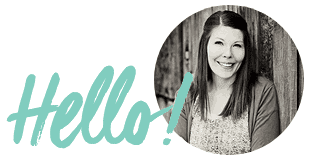 You shouldn’t have to miss out on the tastiness of these bars! My biggest tip, however, is to find a nut butter with a similar thickness and consistency to peanut butter. A lot of almond butters would be too runny, but I’ve found some cashew butters that are similar in thickness to PB. Give your jar a flip, and if the butter moves at all, it’s probably going to be too runny for this recipe. How long do Peanut Butter S’mores Bars keep? These will keep for up to a week covered in the fridge. Storing them in the fridge will also make the sticky elements easier to cut through when serving! Preheat the oven to 350 degrees. Line a 9-inch square baking pan with foil (let the foil hang over all the edges so that you can use it to pull the bars out of the pan later), and grease the foil well. To make the dough, combine the butter and sugar in a large bowl, and beat until light in color and fluffy, about 3 minutes. Add the egg and vanilla, and beat to combine. Add the flour, and stir until well combined. Stir in the graham cracker crumbs. Press 2/3 of the dough into the bottom of the baking dish. Spread peanut butter over the top of the dough, sprinkle the chocolate chips evenly over the peanut butter, and then carefully spread the whole container of Marshmallow Fluff over the chocolate. Then, gently press the remaining dough evenly over the Marshmallow Fluff. Bake for 25 minutes, until the crust starts to turn golden-brown. Remove from the oven, and allow the bars to cool for an hour in the pan. After an hour, use the edges of the foil to remove the bars from the pan. Let the bars cool on a wire rack (in the foil) out of the pan until set (this will take a couple of hours). To cut the bars, use a sharp knife, and clean it in between each cut. These are sticky! I had to stick my bars in the fridge for an hour before cutting. 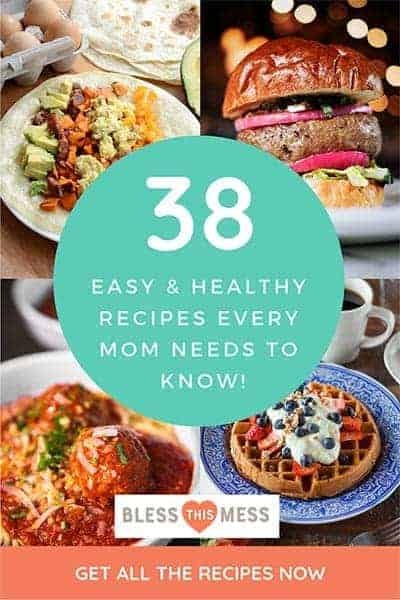 There are so many more recipes where that came from, too! Just search my recipe archives for more. Enjoy, from my kitchen to yours!